Dissolve yeast in warm water and stir in remaining ingredients. beat vigorously 20 strokes, or use a mixer. Let rest only 5 minutes. place basil, garlic, salt, and pine nuts in a blender or food processor until finely chopped. add olive oil with motor running, the add cheese. blend one more time until ingredients are mixed well. and whatever else sounds good on a pizza! Roll out dough on parchment paper or pizza pan. Spoon on pesto sauce, generously. Add shredded mozzerella, then about 1/3 as much parmesan and romano, once again don’t skimp. Sprinkle with a handful of pine nuts. 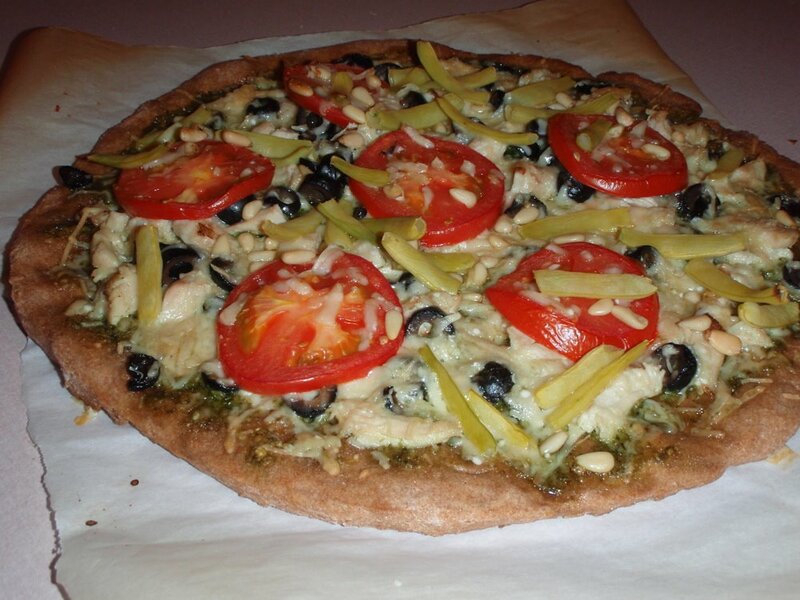 Bake on a pizza stone with parchment paper at 425 for 15-20 minutes. -If you don’t have a pizza stone just use a pizza pan or cookie sheet, but a pizza stone really makes the crust turn out yummy. I would recommend having a pizza stone in any kitchen. I cook frozen pizza on it as well, on those super busy or babysitter nights. I transfer pizza & parchment to the hot stone in the oven by cookie sheet, and back out of the oven the same way.